Adam W. Holtman | Joel H. Schwartz, P.C. 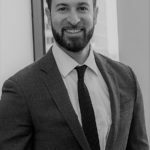 Adam Holtman is an associate at Joel H. Schwartz, P.C. He focuses his practice on auto accidents, slip and falls, dog bites, and social security disability. Prior to joining JHS, he worked at a well-known Boston firm. There, and in addition to his personal injury practice, he flew all around the country arguing at over 200 administrative hearings for those looking for social security disability benefits. His desire to help people in need is what brought him to Joel H. Schwartz, P.C. Adam received his B.A. from New England College in Henniker, NH and his Juris Doctorate from Suffolk University School of Law. In his spare time, he enjoys golfing and running. He also admits to being a bit of a history nerd and is a huge fan of the Boston sports scene. He is also very passionate about the Special Olympics and Strides Against Breast Cancer.